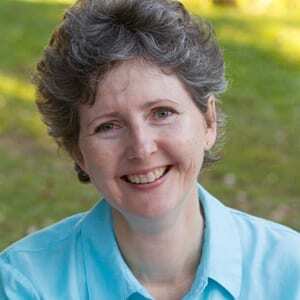 Today, I am reposting a great article from Belinda Pollard, a writer, editor, writing coach, and former journalist from Down Under. That’s Australia, not that other place where none of us ever want to wind up! 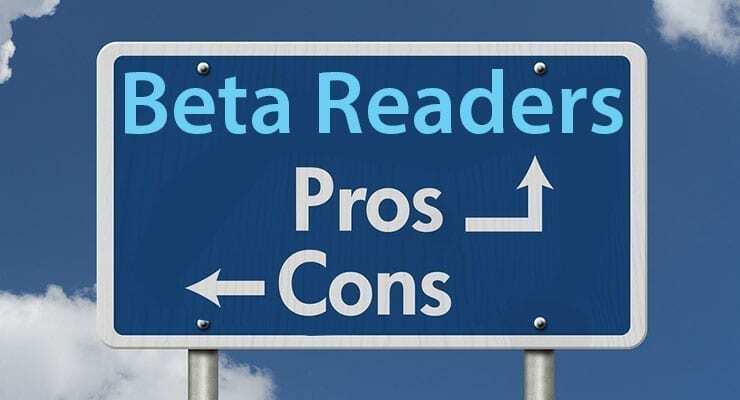 Belinda recently posted a survey she conducted about the pros and cons of Beta Readers, also known as “First Readers.” I found it enlightening, and I hope my fellow writers out there will also. A lot of what she learned from her survey are things that I have also experienced. Read on. My first survey question was: What is the biggest problem you face with beta readers? I deliberately started with an open-ended question which allowed people to tell me whatever came first to their minds, without any prompting from me, and without them knowing what others might be saying. Out of 146 responses, there was a surprising (or not-surprising??) number of common themes. Forty-six people said that their biggest problem was finding the right beta readers – people who were right for the genre, had the necessary skill, could understand the beta reader role and knew what was expected of them. Forty-four people said they had trouble getting beta readers to return their feedback fast enough, if at all. Twenty-four people said beta readers were too nice and had trouble giving useful criticism. Twelve people said they received feedback that had too little detail to be any use. And seven respondents said people insisted on correcting typos when it was not what they wanted from a beta reader. I’ve got some possible solutions, but first, let’s look at the rest of the results. I asked what writers most wanted to receive from their beta readers. 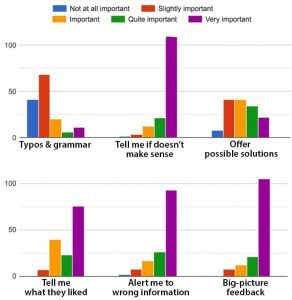 These graphs show the responses. Fix typos and grammar– most writers saw this as only slightly important or not at all important. If that surprises you, check out this article on why correcting detail is not often the best task for a beta reader. Tell me if my book doesn’t make sense– the vast majority of writers saw that as very important. Show me possible solutions to the problems in my book – this was more evenly spread, from slightly important up to very important. These answers might vary according to the confidence of the writer and the insight of the beta reader. Tell me what they liked about it – this one tilts towards important to very important. I think this element often gets overlooked in detailed critical feedback, and yet those authentic positive statements give the writer courage to persevere with the enormity of the rewrite. Alert me to wrong information – the majority saw this as very important. Big picture feedback, e.g., too many characters or events in the wrong order (fiction & memoir), or for non-fiction such things as poor structure, weak arguments, etc. – the writers in my survey overwhelmingly saw this type of feedback as very important. I asked the respondents whether they’d had any bad experiences with beta readers. Many of them expanded here on what they’d said in Question 1. Many of the bad experiences they reported related to getting exceptionally negative feedback from a beta reader, without any sense that the book was redeemable. Some found this crushing. Conversely, some were disappointed that they’d received only positive feedback, but it had been too brief and shallow to be any use. Others told of people fixating on small details and missing the main point, while some referred to arrogance from their beta readers. There were also multiple reports of beta readers being too slow or never submitting any feedback. Beta readers revealed both strong points and weaknesses, discovering inconsistencies such as names or character details that accidentally changed. They spotted things that weren’t plausible or didn’t make sense, moments that might confuse a reader, and times when the manuscript became boring. They noticed phrases or words that were used too often, helped reduce wordiness, and caught ‘obvious’ problems that the writer hadn’t noticed. Some contributed specialist skills or technical knowledge. Writers reported beta readers who brought a professional attitude and creativity to the task, who mentioned what they liked about characters, and explained parts of the story that resonated. Their feedback helped writers strengthen the ending. Writers reported beta readers who were kind, honest, encouraging and generous, who asked intelligent questions and sparked wonderful conversations while presenting criticism in a respectful Some particularly appreciated the opportunity to ask more questions of a beta reader later. Some writers mentioned beta readers who gave helpful, concrete suggestions on such issues as readability and how to improve the clarity of the author’s voice – without trying to turn it into someone else’s voice. Beta readers helped writers see their manuscript possibilities, resulting in a better book. Writers mentioned feedback processes that generated better results after they started giving more detailed briefings to their beta readers (I was particularly thrilled about this – see my suggestions below). The next question asked whether people had done beta reading for other writers. The good news is that most had found the experience rewarding, but there were a few glitches along the way. Many said they felt honored to be asked, enjoyed being first to read it, and loved helping Many enjoyed offering big-picture feedback, and said it worked best if the writer and beta reader were a good fit, and they liked the book and the genre. Some preferred not to read manuscripts that were poorly written or still a rough first draft. Some wouldn’t read for random writers, but only for people they knew. Some declined beta reading because they were time-poor, or the timeframe was too tight. Others were very selective about beta reading opportunities, because of the substantial time commitment. Some felt embarrassed that they were ‘slow’ beta readers. Some beta readers reported finding the task draining, stressful and harder than they expected. Some felt overwhelmed or even scared. Some found it a challenge to be helpful without being hurtful, hard to be honest without being discouraging, and feared they probably gave too much detail. Some were disappointed that the writer didn’t seem to benefit from their input or know how to use it. Some felt frustrated when the author didn’t adopt their suggestions, but others were relaxed about whether or not their suggestions were used. Some didn’t enjoy the process because their author was offended, and some felt their author just wanted flattery. Others were annoyed when they received no thanks for their feedback. On the plus side, some said the writer’s appreciation made their task worthwhile. They enjoyed seeing a writer wrestling with how to make a book work and were particularly satisfied to watch a writer they’d helped go on to great things. There were other benefits, too. Some learned a lot about writing from reading other people’s drafts with a discerning eye. They learned from the way different writers worked and became more aware of their own mistakes and possibilities. My methods are shaped by my work as a developmental editor over a couple of decades and years of trial and error getting useful beta feedback for my own manuscripts and helping my editing clients get beta feedback for theirs. I try something, observe what worked and didn’t work, and then I test it again. Finding the right beta readers. Getting the right type of feedback. Chapters 3 and 4 of the Beta Reader Superhero Writer’s Handbook, including how to find specialist beta readers. Chapters 6 to 8 of the Beta Reader Superhero Writer’s Handbook. Chapter 9 of the Beta Reader Superhero Writer’s Handbook covers how to get the most out of feedback. The right techniques can sometimes turn what seems to be ‘poor feedback’ into surprisingly useful information. Sometimes we’ve chosen people who are too busy or not motivated, BUT sometimes we simply need to communicate effectively about when we want it, and why we want it at that time. Gentle, polite reminders can also make a big difference. We also need to manage our own expectations. Most of our beta readers have busy lives, and it might take them several of their precious relaxation-days even to read the manuscript (fitting it in around other responsibilities) – let alone think carefully and creatively about their feedback. Whenever possible, I allow 3 to 6 weeks for my beta readers, and a similar length of time for me to process the feedback, before any publishing deadlines. It’s not always possible – sometimes timelines are tight. But it’s when I’m doing other things over a period of time that my rewriting strategy gets a chance to mellow and mature in the back cupboard of my brain. So as the years pass and I see more evidence of the cost of rushing the process, I’m fighting more and more for that longer timeframe for both me and my beta readers. What are your experiences with beta readers? What has worked for you? Scroll down and join the conversation below.